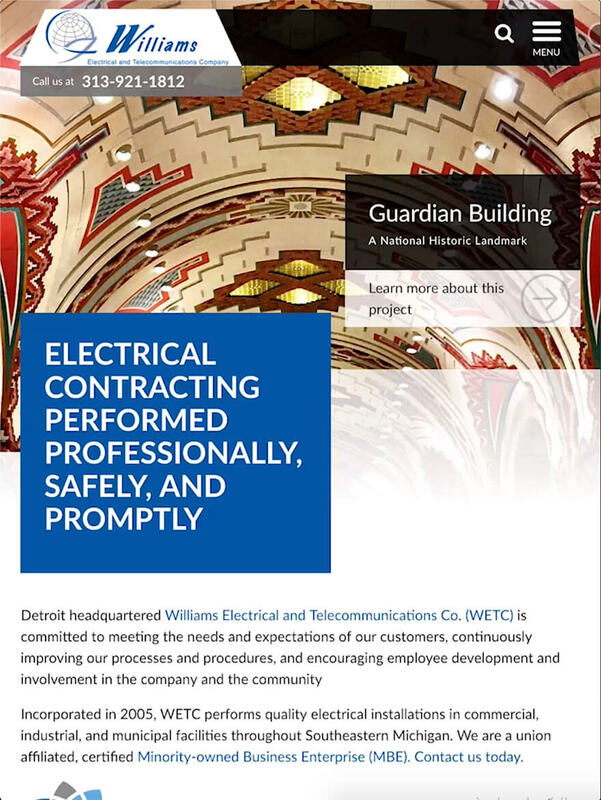 Williams Electrical and Telecommunications Co. (WETC) performs quality electrical installations in commercial, industrial, and municipal facilities throughout Southeastern Michigan. A subsidiary company of Motor City Electric, WETC executes services professionally and promptly with leadership, quality, and safety as their main goals. 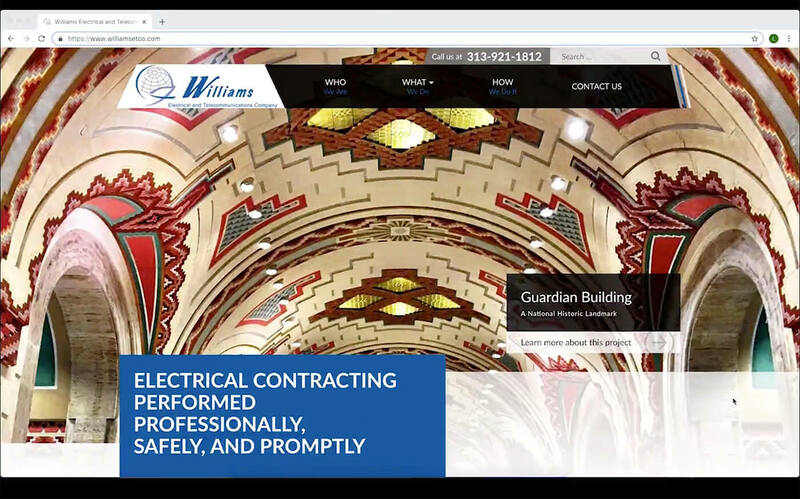 After rebuilding its holding company’s website, Motor City Electric (MCE) returned to TM for WETC to receive a new, innovative website as well. Their original website lacked interactive features, mobile-friendliness, good overall user experience, and high-resolution photos. MCE wanted WETC’s rebuild to encompass most of their new features. These features include representing their body of work, reflecting a modern style, delivering great SEO results, and providing easy navigation. TM followed the same style and design as MCE’s newly designed website. TM crafted a custom, mobile-friendly WordPress website that provides simple content management and implements great interactive features for easy navigation and quick responsiveness. The WordPress content management system allows internal staff to update and modify the website. It is also completely optimized for SEO performance. Additionally, this new WETC website features great loading speeds on mobile devices. Prospective customers are searching more on mobile devices, including tablets, so it’s imperative to have this website function on all devices, no matter the size of the screen or operating system. The TM team also integrated our TM Project Gallery Plugin to provide a one-of-a-kind user experience and simple organization. Customers can view WETC’s diverse projects with detailed information about the client and the work completed. The custom plugin performs with the greatest functionality, speed, and agility. Since launching the website rebuild, TM provides monthly website maintenance and SEO related tasks. TM installed its custom WordPress plugin to showcase WETC’s projects. The TM Project Gallery Plugin generates a project grid listing after adding current or past projects. 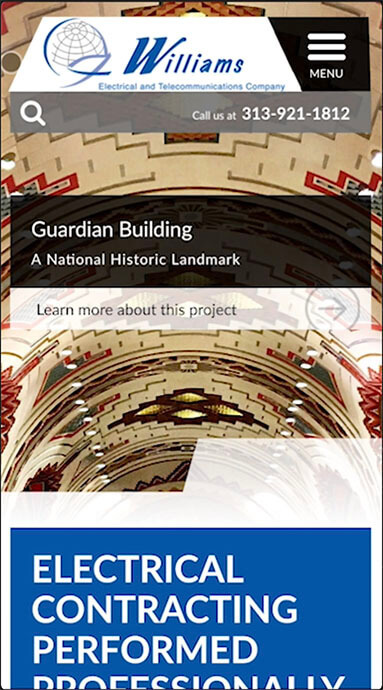 It shows the individual project listings complete with descriptions and photo gallery and can filter by its particular service area. WETC’s website is big and bold, like its holding company, MCE. They tackle big and bold projects, so they needed a design to reflect that. We took the opportunity to go outside the typical boundaries of containers, created depth, and pushed the limits of a classic design. Our skilled developers created an animated version of WETC’s globe logo to move before visitors reach the website’s footer area. Like MCE’s other subsidiary companies, such as MidSouth Contractors and Stelko Electric, Inc., the rotating graphic is steady and true to its well-respected brand.